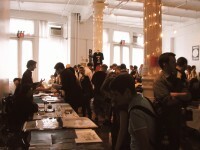 It is a bit unfair, perhaps, to say that Museum of Comics and Cartoon Art's Art Festival (MoCCA) has supplanted the Small Press Expo (SPX) in being the significant small press comics convention. After all, if anything, the success of MoCCA should prove that general interest in comics has grown to the point where the East Coast can support two relatively large small press shows. And yet, as I was leaving the Puck Building on Saturday after spending the better part of six hours schmoozing and buying comics, I seriously wondered whether I needed to attend SPX this year, when I would see many of the same people selling the exact same books. This was my first MoCCA, and I was pretty impressed with the event overall. Considering the fact that it was held smack dab in the middle of New York City, I probably shouldn't have been too surprised at the large turnout. 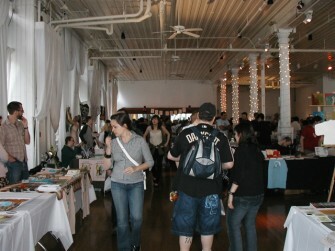 The place was so packed in fact, that at times it was difficult to get around a particular aisle or booth. One of the most interesting things to me about the show was that most of the folks there seemed not just passionate about comics, but young. There were a few older folks there, of course, and several thirtysomethings like myself, but by and large it seemed the show skewed young, with the average age being somewhere between 18 and 30. There were even quite a few children at the show, at least more than I've ever seen at a comics convention before. Certainly in the case of Alexa Kitchen you had one debuting a book at the show, the perfectly-titled Making Comics Is Easy (Except When It's Hard). The other impressive thing about this year's MoCCA is the number of women that were in attendance, not just exhibitors but consumers as well. In a year where the issue of gender has garnered much, perhaps needless, attention, whether you're talking about the ugly Taki Soma incident or the complaints about Dan Nadel's book or the recent "outing" of Batwoman, it's refreshing to see such a large group of woman devoted enough to comics to come to a show like this. 1) For pity's sake, do a better job of publicizing your event programs. I attended Miriam Katin's slideshow/talk and was rather saddened to find it so sparsely populated. The lack of signage and announcements probably didn't help matters. Let's not have this be a buy and sell show, please. 2) With all the milling about and shouting and such, it's usually hard at most comic conventions to carry on a conversation with someone. 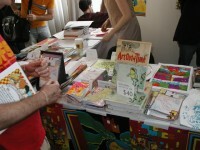 At MoCCA, however, it seemed especially bad. Attempting to interview someone soft-spoken like Bryan Lee O'Malley proved to be an interesting exercise to be charitable. I'm not sure what the MoCCA folks could honestly do about this to improve the sound quality, but it is noticeable. And it is annoying. Right now, SPX and MoCCA both hold entertaining, but similar events, with SPX slipping in past years in regards to respect and recognition. I'd like to see both shows do well, of course, but one will have to go through a bit of restructuring in order to distinguish itself from the other. And right now I think that onus lies on SPX. I had heard how last year's event was so steaming hot it was virtually impossible to enjoy. This year, the weather was comfortable and mild and perfect for a festival like this. Even though my time there was brief, it was nevertheless most enjoyable, and I walked out of the Puck Building filled with goodwill for the art form I loved so well. Those warm fuzzies were all but annihilated once I returned to Amtrak and found out that my train was over an hour late and that my connecting train in Philly would likely leave without me. I got home all right, minus a good deal of stress, but soon realized that at least 10 of the books folks had given me review copies of had somehow vanished. So if you were at MoCCA and came across a book lying on the floor, inscribed "to Chris," be a dear and let me know, OK?